Street-fighting on Eglise Saint-Merie, Paris, 1832, during the unsuccessful revolt that is the climax of the novel and its movie adaptations. Victor Hugo embedded his mammoth novel within a rich historical context saturated with references to specific institutions, events, locations and people. Although the various cinematic adaptations -and the stage musical - of the book necessarily omit much of this context, these versions still contain references that can enhance the viewer's understanding of the film. However, many viewers were and still are, puzzled or intrigued by some of the allusions. When did the events of Les Misérables occur? The novel is set during a momentous era of French history, the period from 1815 (Waterloo) to 1833, just after the failure of the Paris uprising the previous year. These years featured the fall of Napoleon, the return of the Bourbon monarchy to France, the overthrow of that monarchy in 1830 and its replacement by another branch of the royal family, the Orleanists, and the revolution of 1830, followed by an unsuccessful revolt in Paris in 1832. Hugo also uses flashbacks to the French revolution that began in 1789, the Napoleonic wars of the early 1800 in Europe, and flashes forward to the revolution of 1848. Given that the climactic scenes of the various movies and the stage musical all feature rousing scenes of revolutionaries in Paris, it's little wonder that viewers are sometimes confused about what event thay are watching. The key events of the movie versions (except Lelouch's great update to the 20th century) relate to the period from 1815 to the July revolution that overthrew the Bourbon monarchy in 1830 and then to the failed June rebellion of 1832. And the scenes of revolutionaries fighting in the barricades to occur in Paris during the 1830 revolution that overthrew King Charles X and stopped him re=establishing an autocratic rule. It's easy to confuse the events of 1830 and 1832, especially since the success of the musical, which uses the iconic imagery of Delacroix's famous painting "Liberty Leading the People" in its climactic scene and also in its advertising. In fact, many people confuse the July revolution and the 1832 revolt with the French Revolution that began in 1789. What's the significance of the painting Liberty Leading the People ? Delacroix's huge painting "Liberty Leading the People" is one of the most famous political statements in the world of art, and key elements of it have been appropriated in several movie versions of "Les Misérables "and in the stage musical and its 2012 movie adaptation. Many people associate the painting with the French Revolution of 1789, and those who have seen cinematic adaptations and the musical often believe it illustrates the 1830 July revolution that overthrew the restored Bourbon monarchy in the person of the reactionary Charles X and replaced it with Louis-Philippe (the "Citizen King") of the junior Orleanist branch of the royal family. In fact, Delacroix's masterpiece commemorates the Paris uprising of June, 1832, the climactic event of Hugo's novel, an attempt to remove the new monarchical government. Yet the revolt was a failure and for almost two decades Louis-Philippe ruled with the support of the bourgeoisie. The uprising is used as a climax in some movie versions,(notably the 2012 film) and in the musical adaptation, in which the emblems of barricades, flags and scattered bodies play key roles in the staging. (see below for two scene from two recent stage productions). The painting seems to evoke a mood of triumphant rebellion overthrowing oppression. Significantly, the rebels are identified with Liberty, a majestic figure who nonetheless seems human, and who holds a bayoneted rifle. BY her side are a young boy and a young man in the garb of a student / intellectual. The the three are climbing over bodies that include a soldier (the military were sent to crush the revolt) on the right and a half-clothed victim of government violence (suspected rebels were dragged out of their houses at night by police and soldiers). The painting also depicts the barricade, an iconic image of the revolt, one adapted in various cinematic adaptations, especially Tom Hooper's 2012 take on the musical. Above : elements of Delacroix's painting in recent productions of the musical: note the barricades, the flag, the sprawled bodies. 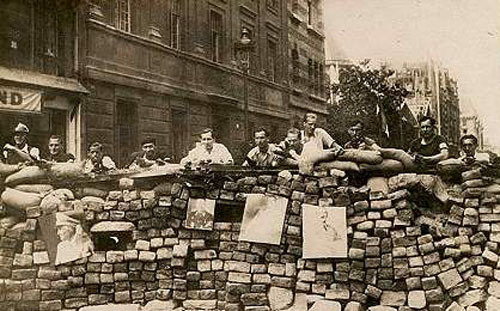 Barricades have become an iconic feature of French history since 1588. On 12 May that year (the year of the first Spanish armada) the Duc de Guise, supported by elements of the Catholic church in the form of the Catholic League and the aristocracy, orchestrated a violent protest against King Henri II's attempts to relax the crippling restrictions on the nation's protestant minority. Guise and his supporters orchestrated demonstrations that featured the building of barricades made out of wagons, timber, stones and barrels in order to prevent effective action by the king's forces. So successful was the tactic that the intended reforms were abandoned and the event became known as the "Day of the barricades". Barricades in Paris also proved to be potent in the 1789 revolution and in the July revolution of 1830, but less so in the failed Paris insurrection of 1832. But they played important roles in the 1848 revolutions in Paris (and Berlin), in the Paris Commune of 1870, the liberation of Paris in 1940 and the so-called student revolt in 1968. Victor Hugo's description of barricades from Les Misérables: "frightful masterpieces of civil war"
It was the acropolius the raggamuffins. Carts overturned roughened the slope; an immense dray was displayed there, crosswise, the axle pointing to the sky, and seemed a scar upon that tumultuous facade.... a chaos full of despair, rafters from roofs, patches from garrets with their wallpaper, window sashes with all their glass planted in the rubbish ... chimenys toirn down, wardrobes, tables, benches, a howling topsy-turvy...."
1588: Duc de Guis at one of the barricades built by his supporters. 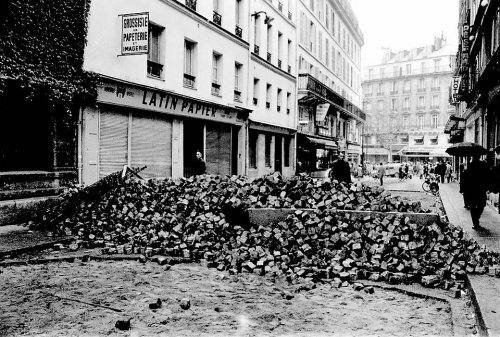 1848 revolution Paris, Rue Martin: barricade -note resemblance to Hugo's description in novel. 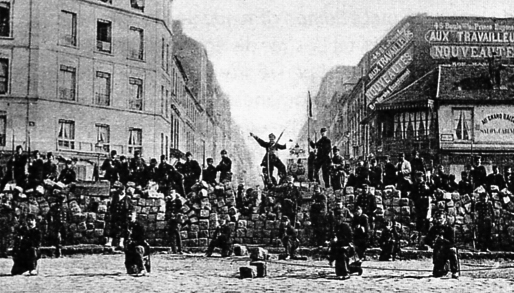 Barricade Paris Commune March 1871. Barricade built November 1944, liberation of Paris from Nazi German rule. What's the connection between Les Misérables and The Dark Knight Rises ? One of the most interesting features of the Batman finale is its focus on revolution. Some see the movie as on the side of the wealthy and the privileged, casting Gotham's citizens as gullible, naive and jealous fools, tricked into insurrection. Others see Batman as the defender of justice and stability, appealing to the better instincts of the population in a struggle against oppression. As Alex Crumb has claimed recently: "The Dark Knight is Les Misérables in Reverse". Crumb, writing about Tom Holland's 2012 movie, suggests that "Bane is Jean Valjean, and Batman is Javert". [http://www.ghostlittle.com/blog/bid/162867/The-Dark-Knight-Rises-Is-Les-Misérables-In-Reverse ] He also points out the significance of scenes of massed, confrontational protesters in both movies, including a poster for Knight Rises. I'd suggest that another feature common to Hugo's novel, all its movie versions and Dark Knight Rises is their concern about the nature of justice and its purpose. Is justice more than revenge and retribution, to what extent does it cross over into vigilantism and which is more important - the letter or the spirit of the law? How accurately do movies depict Valjean's treatment as a convict ? In Victor Hugo's novel, Jean Valjean, was sentenced to five years imprisonment for stealing a loaf of bread to feed his sister's children. But he served nineteen, his sentence being increased for four escape attempts and resisting arrest. He served his time at the notorious Bagne of Toulon prison. His imprisonment is portrayed in varying degrees of authenticity by the various movie versions. The 1952 version, though, has Valjean incarcerated as a rower on a galley, a punishment that didn't exist anymore - galleys had become obsolete. By the time of Valjean's fictional incarceration, prisoners like him were imprisoned in galleys that didn't go to sea, then moved to a prison called the Bagne, where the convicts became known as Bagnards. Movie depictions of the harsh treatment and conditions suffered by the Bagnards are largely accurate. Sanitary conditions were terrible; hundreds dies as a result of the infectious diseases they caught there. Food consisted of dried vegetables, especially beans, wine and a little meat. Prisoners were branded on the shoulder; their right foot was enclosed by a shackle attached to a short chain. Powerful sequence from Lewis Milestone's 1952 movie but inaccurate: the galleys were not used by France in the Mediterranean in the nineteenth century. Filming the convict labor sequence in Tom Hooper's version of the musical. Full marks for historical accuracy. Note red vest the convicts wore; another authentic detail. Bagnard, early 19th Century, Toulon.